Leni Robredo, the VP of our beloved land, has sent her congratulatory message to Senator Manny Pacquiao. Pacquiao fought the Australian boxer Jeff Horn last weekend, but unfortunately lost. Despite the outcome, in a true Filipino spirit, Robredo sent her congratulations to the boxer turned senator. While it's all good gesture, one particular line caught the attention of some netizens describing it as a benign try for an epal move. 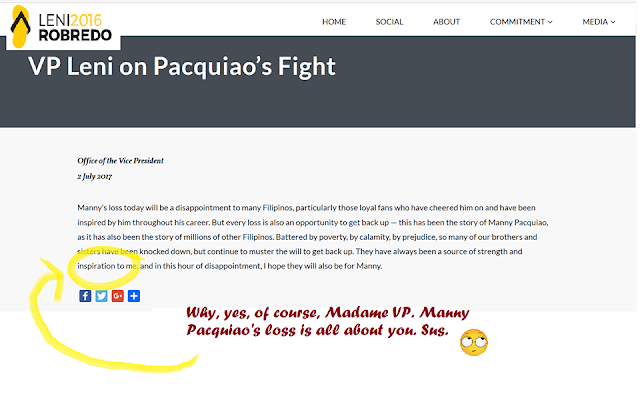 Here's a screengrab from Leni Robredo's website. Everything is just a platform for self-promotion for this public official and her spin meister-wanna-bes. Ok lang sana. Wag lang sobrang obvious. No wonder people accuse her of still being on the campaign trail. This is the sort of post one makes purely for epal purposes. Yung type na pang bandera sa harap ng schools saying, "Congratulations, graduates!" Na if you translate it into trapo talk, it means "Don't forget me in the coming elections, even if I did absolutely nothing except make these meaningless insincere statements to make me sound congressional or presidential or barangay capitanal." Do you think Robredo went too far?